:: C R E A T I V E G E N E ::: Holy, Holy, Holy, Lord, Bless This New Blog! Holy, Holy, Holy, Lord, Bless This New Blog! A new blog is born, The Catholic Gene. And I'm proud to be a part of it! This blog is the brain child of Donna Pointkouski who also writes What's Past is Prologue. It's a blog about Catholic Genealogy and it's authored by a host (see, I can be phunny ;-) of well known bloggers who practice the Catholic faith. In addition to Donna and myself, the team consists of Stephen Danko, Sheri Fenley, Lisa (Smallest Leaf), Lisa A. Alzo, Denise Levenick, Craig Manson, and Cecile Marie Agata Wendt Jensen (aka Ceil Jensen). You'll also likely read posts from the footnoteMaven from time to time. No, she's not Catholic in the traditional sense but we're bringing her into the fold anyway. Hey, this is not your grandmother's Catholic blog! So what is Catholic genealogy anyway? Heck if I know. We're gonna define it as we go. We'll have some blog posts about our own memories of days in Catholic school, introduce you to some saints, chat about a holy day or two, touch on some Catholic rituals, feature some beautiful churches, and look at the lives of some of the faithful who have answered the call to serve their Church... all with a bent towards genealogy. The word "potourri" comes to mind. The 109th Edition of the Carnival of Genealogy will be hosted at The Catholic Gene, tomorrow, September 4th. How's that for starting off with a BANG! 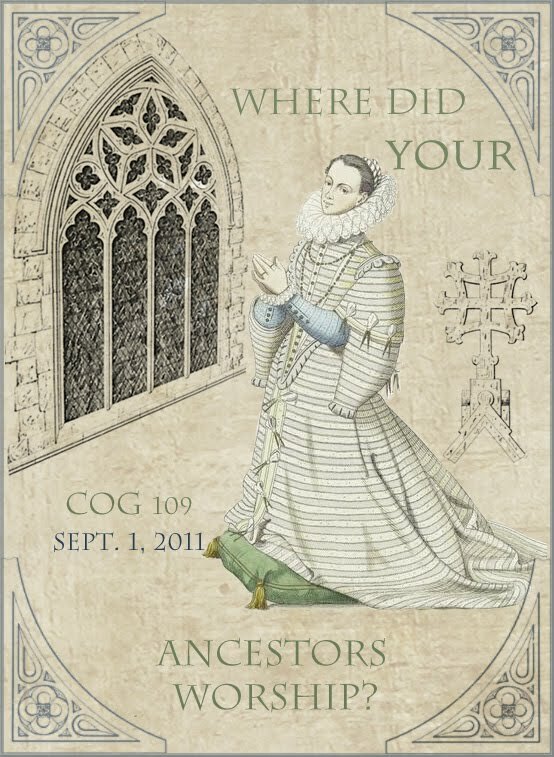 The topic for this edition of the COG is: Where did your ancestors worship? Submissions from those of all faiths will be included. Be sure to stop by and check it out! And while you're there, be sure to visit the Authors page to see the cutest and loveliest Holy Communion and wedding photos of the blog's authors. Not to be missed! Head on over to The Catholic Gene and check us out. Add us to your feed reader too!